3.1 Direct Drive vs. Belt Drive Pumps – Which one to choose? 3.2 Hot Water vs. Cold Water Washers – Which one is better? 3.3 Electric or Gas – Which option is better for Industrial use? Hey, fam! My life has been a perfect definition of the middle-class problems until I owned a pressure washer. I couldn’t keep up with cleaners anymore, but I needed my entire home clean. I used to borrow from homies but then I could not entirely offer them free dinners or gifts all year long in return. So, I researched the different types of pressure washers and that which would be suitable for me. 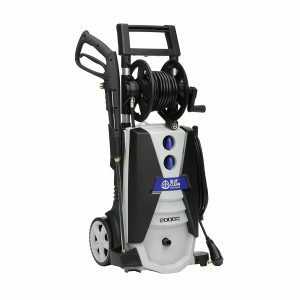 There are several types of pressure washers on the market. Before you even think of ordering one, you should first understand why you need it. You don’t want to own something useless that will end up taking your space and clutter your house. If you operate a commercial cleaning firm, the heavy duty washers generating 3000 PSI or higher are what you need. The light-duty operates at a low rate of 1300 – 2000 PSI, they’re perfect for indoors and cleaning of patios, lawns or decks. Additionally, you’ll need a gas-powered or electric-motor pressure washer if you mainly operate indoors. The petrol and diesel engine washers are great for industrial use unless you’re comfortable with the fumes inside your house. Washers are categorized mainly in three types that is Light, Medium & Heavy Duty. Further Heavy-duty can be divided in two type that is Commercial And Industrial use washers. Light-duty washer ranges from 1300 to 2000 PSI, whereas medium-duty ranges from 2000 to 3000 PSI and heavy-duty ranges from 3000 to 4000 PSI & above. For commercial use washers upto 4000 PSI is enough but for Industrial use, pressure cleaners must have power more than 4000 PSI. And this makes a different category of washers for industrial use and yes it costs way more than a normal home use pressure washer. Let’s start our review with light duty first. With a pressure output of 2000 PSI, the AR390SS electric pressure washer performs all outdoor cleaning quite easily and fast. It has a motor speed of 1.6 HP delivering up to 1.4 GPM. It is therefore among the best indoor or domestic pressure washer. Setting up this washer is a breeze. All you got to do is connect the pressure hose to the gun while the garden hose to the water inlet. Plug it into the main, pull the trigger and get going. Unlike most gas engines, this one is quieter. Your neighbor doesn’t need to wake up by the noise created, just to realize you’re cleaning your home. Right? AR Blue Clean will use 80% less water, and therefore, environmentally friendly. It includes a pressure washer gun, wand, four different nozzles, 30 ft. high-pressure hose and a 48 oz. detergent tank. Moreover, the Total Stop System (TSS) technology ensures that the pump automatically shuts down when the trigger is not in use. Having a pungent smelling trash can which you can’t stand washing with your hands? (How are you even going to do it?) AR390S has got you covered. This washer will brighten your decks, lawns, patios, driveway, siding, outdoor furniture, fence, car and more. It will blast away mold, old paints, grime, dirt or moss for a well-defined fresh look on your surfaces. The standard nozzle for general residential cleaning is 25˚. However, for a more specific point, use 0˚. Need to incorporate your cleaning with detergent; the soap nozzle will automatically activate the detergent tank for easy application with the spray gun. Conversely, you need to be vigilant when working with electricity, long trailing cables and water. You can reduce the risk by using Residual Current Devices (RCD) or Ground Fault Interrupter (GFI). Auspiciously, AR390SS’ power cord features an auto-rest GFCI module. The Simpson MSH3125-S is gas powered operating at 3100 PSI at 2.5 GPM. It is powered by Honda engines which are ever known for their top quality, versatility, and excellent performance. Therefore, Simpson stands to be rated among the best, together with the Patented PowerBoost Technology it has been incorporated with. The washer is very easy to use, lightweight but sturdy enough to withstand heavy-duty use. The 25-foot high-pressure hose is kink and resistant to abrasion. It can withstand the pressure of up to 6000 PSI. Additionally, durability is achieved by the welded steel construction, 10” pneumatic tires for mobility and heavy gauge frame components. Other features include a siphon tube for detergent application, spray gun with safety lock-out and axial cam pump. Depending on your needs and the surface you want to clean, Simpson washer has five different nozzle tips to choose from. You can either use the 0˚, 15˚, 25˚ or the 40˚ to clean any surface in your home. This place may include the floor, windows, patio, furniture, fences, driveway, decks, Pool, siding or lawns. Besides, the pressure washer can clean any surface that you want to be painted. For domestic use, you should avoid using the least angled nozzle which presents the highest pressure. The trick of getting desirable results is selecting the right one. Featuring a robust Generac OHV engine, Generac 6565 gas powered pump will solve all your commercial cleaning problems. It has got every feature that you’ll need in a pressure washer. Cleaning is rapid and on point, thanks to the power output of 4200 PSI. The washer includes five easy-to-fix nozzle tips between 0 – 40˚ and pro-grade Triplex pump that’s more powerful than conventional axial cam pumps. 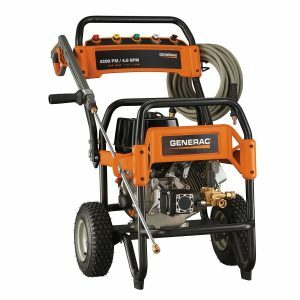 For ease of mobility, Generac 6565 has oversized pneumatic tires while the pump is slightly raised above the ground. No more kneeling down to connect the hose! The low-oil shutdown sensor will always alert you when the oil runs low, to safeguard the engine. Generac 6565 is gas powered and great for commercial use where mobility is frequent. It includes a 50-foot hose, wand, gun holster designed from a welded frame for durability. You can handle all cleaning tasks ranging from a patio, furniture, greasy surfaces, paint preparation, vehicles, gutters and more. In case you need to use high pressure, probably to clear stubborn grease or oil, just connect the 0˚ nozzle. It is capable of streaming water up to 50 ft. Hot water pressure washers are similar to normal pressure cleaner machines with one major difference only and that is the hot water. These washers exits hot water/steam from their nozzles rather than a cold/normal water. And to heat the water up, an system is incorporated with the machines with a Storage tank. Hot washers are more effective than cold water washers. If the surface which you are cleaning contains grease, oil dirt, grim or any stubborn dirt, all can be cleared and washed by these washers. It not only moves oil around but cleans it thoroughly making things look more neat & clean. These washers comes in two options that is Gas & Electric. Both types works effectively. It is only a matter of choice which one you prefer more. So lets Start with electric hot water washers first. 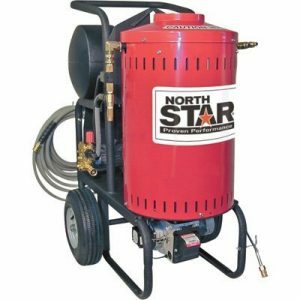 For all industrial cleaning purposes, the NorthStar Electric pressure washer is the ultimate pump to go by. 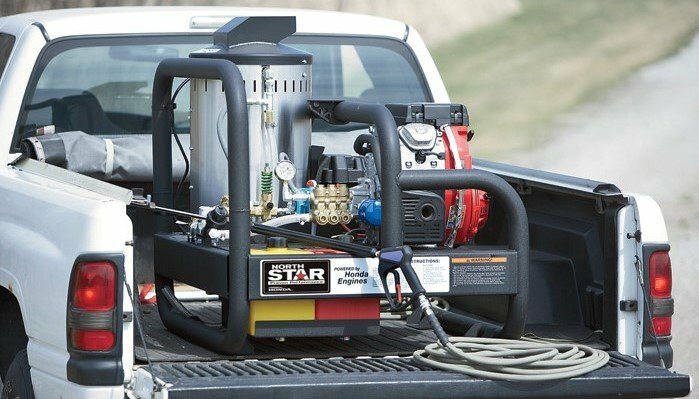 It includes a triplex pump, fuel filter, spray gun, diesel burner, five different easy-to-connect nozzles and a 50-foot hose. With a rate of 2750 PSI, 2.5 GPM and 1.5 Horsepower, NorthStar hot water pressure washer guarantees maximum performance. It has been professionally designed to last longer, thanks to the CAT 2DX pump, ceramic plungers, and brass manifolds. The hose is made of non-marking steel while the forged brass manifold which is much stronger than aluminum. This pump operates with a maximum of 250Â F water. You don’t have to worry about damaging insulation when in contact with water or oil. Insulation will eventually dry and regain its original shape. It supports most fuel types such as diesel and kerosene. Additional features of the washer include 12″ pneumatic tires, thermal protector, and a chemical injector. Cleaning occurs in less than no time since it is a direct drive pump. However, you should settle for Easy-Kleen hot water belt drive washer if you need a pump for frequent use. A direct dive pump has a low span compared to a belt drive pump. This gas powered washer features a 36 inches gun, 50 ft. high-pressure hose, a Kohler gas engine and 13 inches pneumatic tires. Being a sturdy duty pump, Easy-Kleen operates at 4000 PSI with a motor speed of 14 HP and power output of 3.5 GPM. As a result, this washer stands to be the top rated for all industrial cleaning. The model is a triplex plunger pump which assures you of maximum performance and longevity. 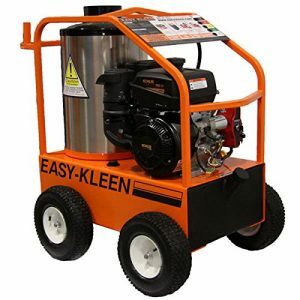 Besides being gas-powered, the Easy-Kleen pressure washer is belt driven. The construction design minimizes wearing out, friction and vibration. All these features, together with brass manifolds, rugged steel frames, and stainless steel valves ensure a prolonged existence. The heavy-duty design allows the washer to withstand extended operations in harsh environments. Depending on the surface you wish to clean, Easy-Kleen comes with five quick-connect nozzles. For surfaces with tough grime and grease, the 0Ëš one will strip it clean due to the high pressure it exhibits. The pump is ideal for extensive dirts like mole & Mildews, peeling off paint, cleaning greasy engines and any other stubborn cleaning tasks. You should take caution when washing your car or furniture with Easy-Kleen. The high pressure may be damaging to most wooden and rubber surfaces, and also stripping paint. Being an extra heavy-duty pump, it requires thorough professional knowledge. We recommend to hire professionals for using these washers. Direct Drive vs. Belt Drive Pumps – Which one to choose? Direct drive pumps are less expensive, but this too comes at a cost. They run at a higher RPM which causes more heat, vibration, and friction on the pulleys. Consequently, these make the pump more susceptible to wear and tear, and therefore, won’t last any longer. For this case, they are not to be used consistently. On the other hand, a belt drive pump is designed to last longer. Due to several internal components, its speed is very slow with low RPM. Your belt drive pump is not likely to wear out, but there’s probability of efficiency loss caused by friction from the many components. You can use it frequently for as long as 20+ hours a week. Belt drive pumps are therefore ideal for commercial and industrial use where there is need for regular use. Hot Water vs. Cold Water Washers – Which one is better? Both hot water and cold water pressure washers do a good cleaning job depending on their features. For your personal home use, the cold water washer will provide exceptional service for clearing dirt or stripping paint. Usually, they rely on the pressure to get rid of grime. The higher the PSI value and the GPM, the more efficient the pump model would be. It is less costly, quite easy to use and maintain. Hence, a cold water pump is best for residential cleaning, with least workload. Nevertheless, if you need one for industrial purposes, you should go for the hot water. Why? The pump will strip through grease, oil, dirt, and grime, thanks to the heat produced. A similar case applies when washing your greasy dishes with cold water. Though you might use as much detergent as you can afford, the grease won’t come out unless it is heated. Furthermore, cleaning will take less time. Electric or Gas – Which option is better for Industrial use? If you prefer comfort, just forget about an electric pressure washer. They will limit your movements because you’ll have to operate within the radius of your power outlet. However, that doesn’t mean that it’s ineffective. Contrary, an electric one works quietly than the gas washers. They are very friendly to the environment, as they don’t emit any poisonous fumes into the air. Likewise, electric washers are less expensive and compact. Their only limitation is that they’re utterly useless where there’s no power outlet. 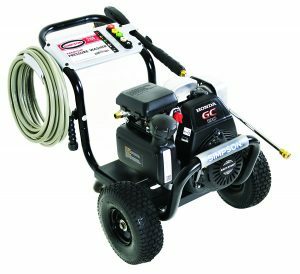 Gas pressure washers are quite bulky but portable, “no electric cord”. Due to their versatility, they are ideal for laundering outdoor surfaces industrial use where there’s need for mobility and substantial cleaning space. Also, using a trailing cable might be dangerous considering that electricity and water are great adversaries. Gas powered pumps operate within the range of 2000 to 3000 PSI. This rate is slightly higher than the electric washers which put out 1300 to 1700 PSI. For this reason, gas washers would clean the most difficult stain on a surface up to 5 times faster their counterpart. Their major drawback is the elevated noise levels of up to 90dbA. It is also more likely to cause injuries and damage to wooden surfaces. With different varieties of pressure washers in the market, you may find it hard to select a suitable one for you. Relying on the manufacturer’s instructions and product rating may not be of complete help. You don’t want to buy a working pump, but upon setting it up, you realize it is meant for industrial use. Neither should you suffocate yourself in your house from a gas washer when you could have instead bought an electric pump. That is why we went a mile ahead of the others and did all the research for you making your buying experience such a breeze. The above information will help you in selecting the best pressure washer, for both commercial purposes and indoor applications. All the pressure washers reviewed are of remarkably high quality and are also durable. What more should you look for? We wish you an exciting buying experience. You have maintains an awesome blog with a pressure washer. Especially the title was amazing!!! But you can add a more internal link, it’s very helpful for SEO.Pros & Cons is best for the product review.